I’ve been wanting to make some chore charts for a while. Originally, they were going to be all cutesy and crafty… which is why they never got done. Eventually I decided that nobody cares, and that I was just going to make some using an Excel spreadsheet. And you know what? They are working great! The kids have gotten into a routine of doing their chores every day after school, and I don’t feel like I have to do everything myself anymore. Because I want to make it easy for you to make your own, I’m offering these free printable chore charts for you to download. I have them saved as Excel files so that you can go in and make your own changes. These are just a basic structure to get you started. The pictures are all just Microsoft clip art, so you can easily add new ones. If you know how to use Excel, you can make these! Rather than making one huge chore chart for the family, I decided to give each of the kids their own. The pictures on theirs take up a lot of room, but they are really helpful if you have little ones still learning to read. 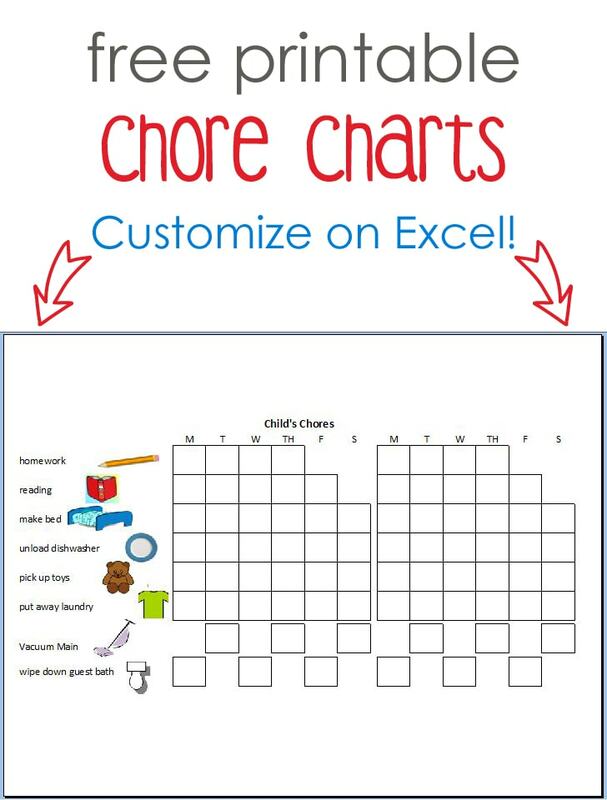 Download the free chore charts here. To see each of the charts, click the tabs on the bottom of the spreadsheet. You can change the names, chores and clipart to fit your needs. Print out new ones every 2 weeks or make them reusable by putting them in plastic page protectors and using dry erase markers on them. Enjoy!